NEW PLAYING / SOCIAL MEMBERS ARE WELCOME ALL YEAR ROUND. PLEASE Please contact one of the captains (Sukh Dhillon, Chirag Desai, Gully Khan, Tahir Razaq or Harry Randhawa) for more information via the "CONTACT" page on the top menu. Adult Outdoor training takes place every Wednesday 6.30pm-8.30pm (Mid-April to September). Alternatively, you can pop along to any of the fixtures and we will certainly accommodate. NEW STOKE GREEN CC KIT IS HERE!!! and helmets, please proceed to All Rounder for your order! We're currently negotiating with a new supplier for kit to be supplier for 2018 and beyond as our agreement with Surridge has come to an end. @IckenhamCricket Go well chaps this season. Looking forward to crossing paths in the league once again! 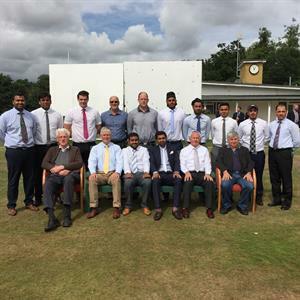 @beaconsfieldcc @sloughcc Go well chaps today and for the season ahead! @westburycricket @TiddingtonCC @Bloxhamsport Go well this season chaps!